Kenya Moore has been missing in action. The “Real Housewives of Atlanta” star is floating further and further away from the show’s orbit. As fans of her crazy personality and those outrageous brush ups with the rest of the cast, we’ll admit — we kind of miss her. In case you’ve been living under a rock or just not that much of a RHOA fan, Moore has decided not to return for the upcoming season. Last year, the former pageant queen ran off and got married to her dream guy, Brooklyn’s SOCO restauranteur, Marc Daly. Now Moore, 47, is due to become Mama Daly any day now. The couple celebrated the “impending life of #babydaly,” as she put in an Instagram caption, with a lavish royal shower. The mama-to-be glowed in a gold brocade gown complete with gilded headpiece. 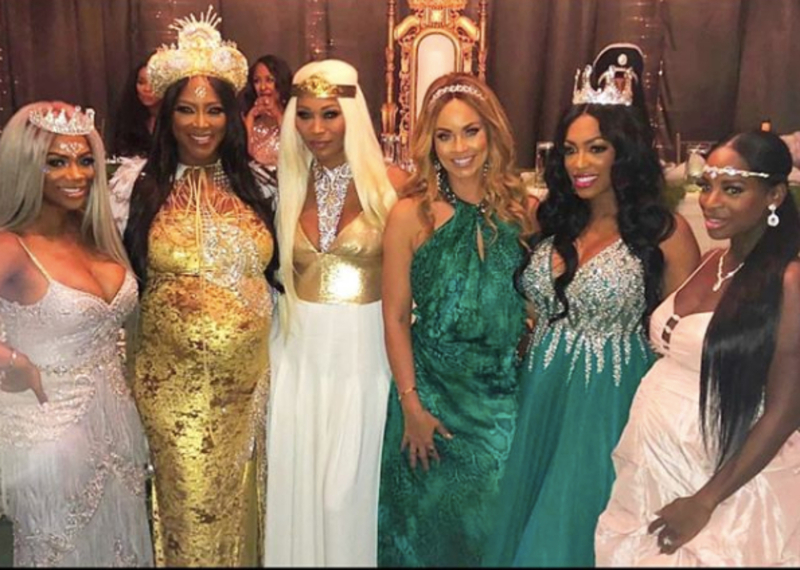 Guests at the fancy Met Gala/fairy tale themed-bash included RHOA stars, Cynthia Bailey, Kandi Burrus, Porsha Williams, and Shamea Morton. Other Bravo-lebrities in attendance included “Real Housewives of Potomac” star Gizelle Bryant and “Married to Medicine” stars Dr. Heavenly Kimes and Toya Bush-Harris. Congrats, Kenya! The countdown to Baby Daly’s arrival is on. We wish you a safe and healthy delivery.